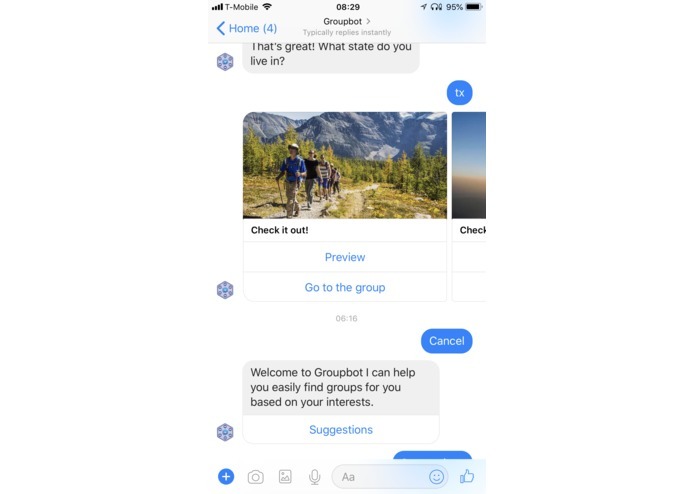 A bot for managing traffic to a collection of Facebook Groups based on user interests. 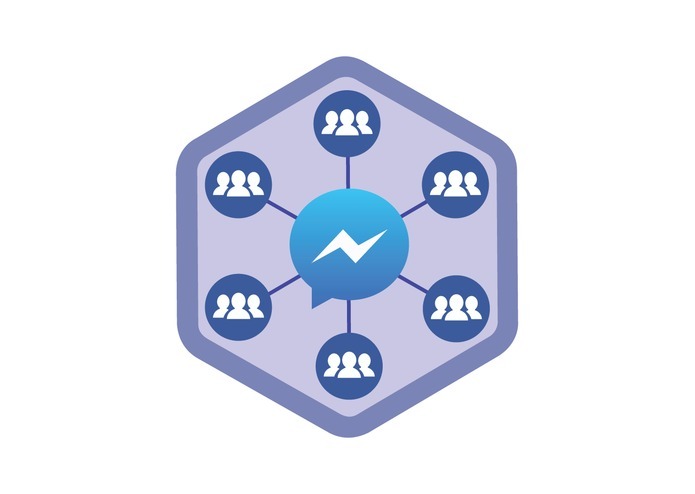 We spoke with the top community leaders of Facebook. HikeitBaby, was kind enough to share their problems and their data with us. 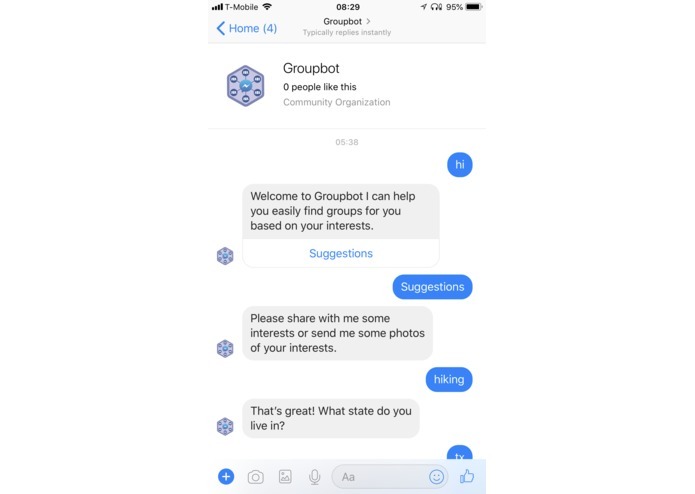 We spoke to most of the community leaders and they all agreed that a bot that could manage traffic to their various community groups would be an amazing sea-change from their current management process. 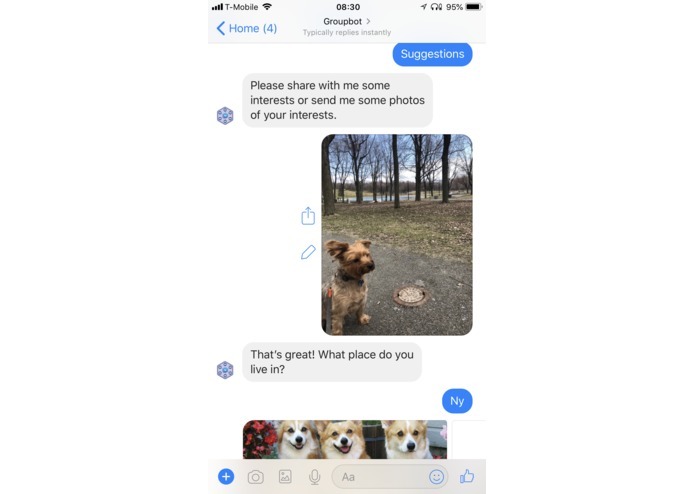 We used a keyword search based on states, but we also used Facebook's AI based image recognition APIs to do a keyword search via what it recognizes in an image. 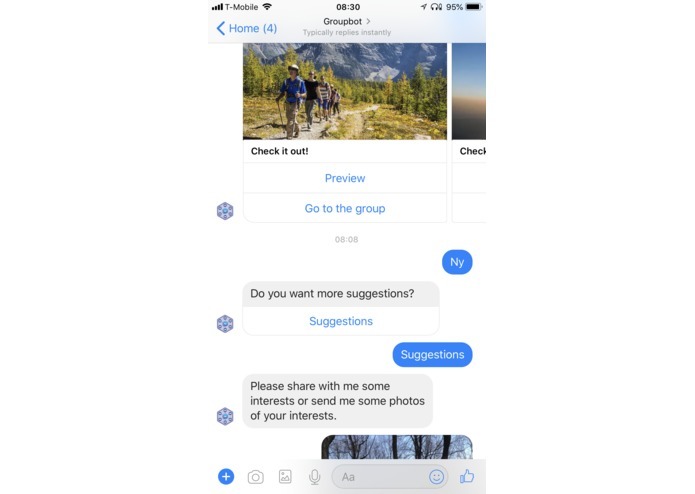 We were of course inspired by Facebook's amazing portfolio of APIs on their developer platform! 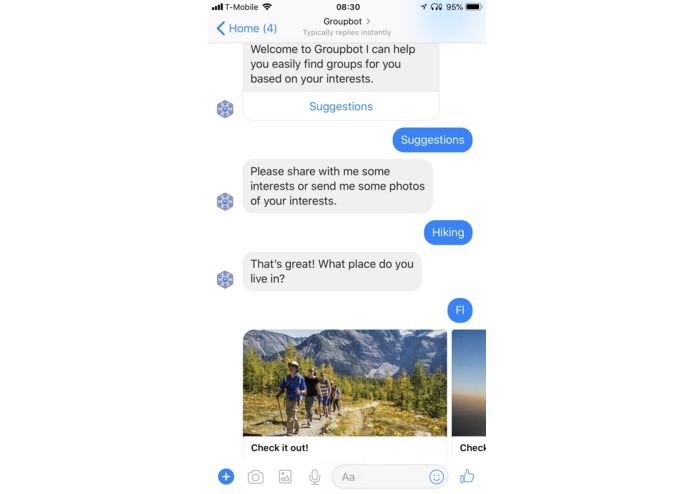 Welcome to Groupbot I can help you easily find groups for you based on your interests. Please share with me some interests or send me some photos of your interests. That’s great! What state do you live in? For extra credit, we used caffe2 and ModelZoo for image-based keyword search for determining interest in certain groups. Built almost completely upon Facebook's Opensource Products! 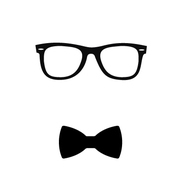 We had to think of ways to get people together based on strict regulation. The neural network was challenging because it was new for us. We're happy that we were able to make a demo with some many of facebook's opensource products! A lot about facebook's APIs and new regulations around accessing user data. Community leaders at this hackathon all say that they desperately need this bot to organize access to their vast community groups! 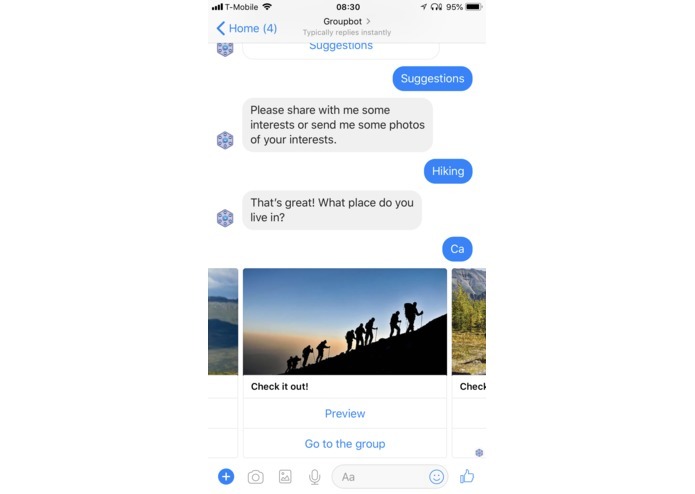 We want to bring this to all your community leaders to launch a bot on their page that can manage their group channels in their wide and varied communities. I worked at the backend of our bot. I implemented image recognition logic using Caffe2 deep learning framework (FB Open Source) and pre-trained Squeezenet model. I also prepared data set, created and tuned the bot App and some messages logic. Learned a lot about Message API and Caffe2. Really inspired by this experience. I worked on the backend of the bot and the DB. I implemented it using Python Flask and MySQL. 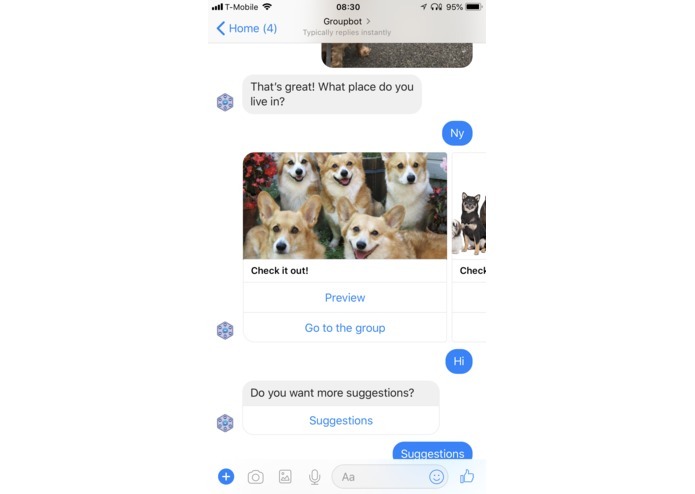 The python backend takes the messages from messenger bot and process them to delver the correct output. necessary conversations with the community leaders, met with Facebook Devs about software architecture constraints and how Facebook protects users data. I also designed the logo and wrote the copy.